A visual framework for ediscovery processes. The Discovery Reference Model (EDRM) refers to both a framework for conceptualizing the ediscovery process and the community that maintains that model. The EDRM framework diagrams the approximate processes involved in ediscovery and suggests an order in which they can be performed. Information governance, the management of information from its creation through its destruction. While not strictly a part of ediscovery, information governance creates the foundation for how data is managed prior to the onset of any litigation. The EDRM community has created a separate flowchart for information governance. Identification of potentially relevant electronically stored information (ESI) once litigation is anticipated. Preservation of that ESI, ensuring that it is kept intact and not spoliated so that it is available for later stages of the ediscovery process. Collection of ESI, wherein preserved information is consolidated into an accessible and protected repository. Today’s cloud-based preservation software solutions often combine this step with preservation by preserving data in place. Data processing, the stage in which repetitive or duplicative information is culled down and, if necessary, converted into a useable form. Review of information for both relevance and privilege. Review is often outsourced to law firms or specialized vendors. It represents the most costly and time-consuming stage of ediscovery. Analysis of ESI, where data is sorted according to the topics it concerns, enabling the discernment of patterns and overall context. Data production, the process of providing data to an opponent in a requested form and according to an agreed delivery schedule and method. By the time data is produced, it should have been culled so that it is not cumulative or duplicative, reviewed thoroughly for privilege and relevance, and organized. Presentation of information in court to persuade the fact-finder of the proponent’s position or argument. This may entail creating videos, tutorials, or displays of important information and putting that information in a context that makes sense and that is understandable to a layperson. People often refer specifically to the distinct “sides” of the EDRM. The left side involves processes such as information governance and preservation; these are less concerned with individual bytes of data and more focused on how broad categories of data are handled or managed. The right side is data-centric, as the information that makes it through the stages of ediscovery to the right side should be increasingly relevant to the issues in dispute. This decrease in data volume and increase in relevance is actually displayed as part of the EDRM model. The triangles aren’t just decorative background shading. Rather, the yellow triangle on the left shows how data volume starts out high and is gradually reduced as the process continues and unnecessary data is winnowed out. The green triangle on the right illustrates how the proportion of relevant data rises as the process continues, until only relevant data is presented at trial. Note that the arrows within the EDRM indicate a direction of flow but also cycle backward to earlier stages. This reflects the iterative and recursive nature of ediscovery: data analysis may reveal new topics of information that should then be preserved, collected, and so on. The EDRM model was first created in 2005 by George Socha, Jr., and Tom Gelbmann to “address the lack of standards and guidelines in the ediscovery industry.” Available as a full-size poster, the EDRM framework is regularly updated to inspire continuing discussion and improvement. Still, the model is not perfect; it hasn’t kept pace with recent technological advances, such as preserving cloud information in place, and it doesn’t contemplate early case assessment (ECA). The EDRM community is careful to note that the model is intended only as a springboard for the development of an ediscovery process, not as a final product. The EDRM community is now affiliated with the Duke Law Center for Judicial Studies and is supported by industry leaders in ediscovery technology. Together, the community is trying to influence the way that legal professionals think about and conduct ediscovery through thought leadership and process development. Both the EDRM model and the EDRM community are valuable resources for ediscovery professionals. The EDRM describes both a framework and a community. 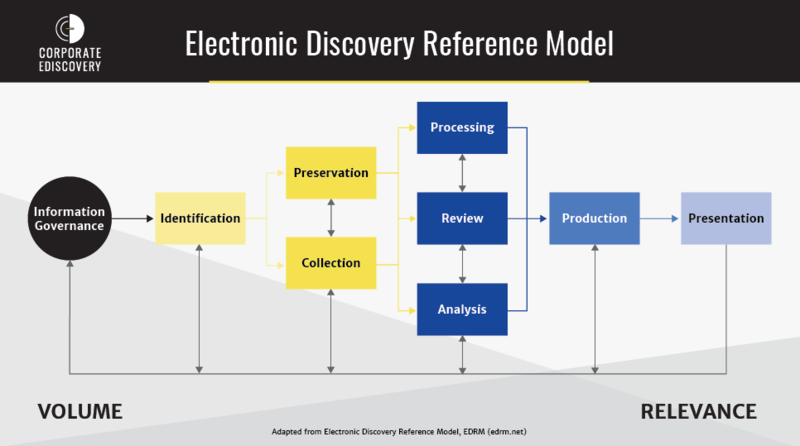 The Electronic Discovery Reference Model (EDRM) is, first, a model for conceptualizing the ediscovery process from preservation through presentation. The EDRM is also a community of thought leaders that maintains the EDRM framework and provides rich resources for ediscovery professionals.